Two years ago, I wrote about my husband’s flair for imaginative gift-wrapping. (See Exercises in Extreme Gift Wrapping, December 2011.) H was born into a family of happy wrappers. One of the pillars of their holiday tradition is the inventive wrapping of every single gift, no matter how large or small, no matter how humble. A bracelet might be hidden in a box sized for an appliance. If an object has a recognizable shape, it’s typically disguised in another box. Multiple containers are frequently employed. The family name is undoubtedly enshrined in a place of prominence in the gift-wrap hall of fame. My family’s approach to gift wrapping, on the other hand, may be described as practical and decorative. Certainly, compared to H’s family, we are wrapping minimalists. But then most of the world would be, as well. 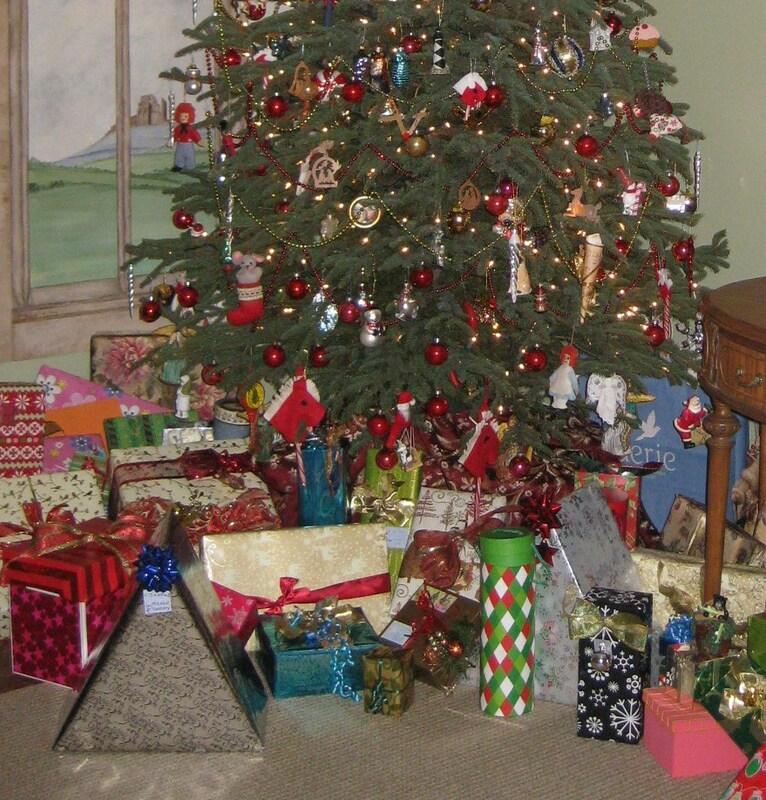 I was unprepared for the sea of multi-colored gifts that flooded the living room on our first Christmas together at H’s parents’ house. My husband has continued the tradition in his own way. 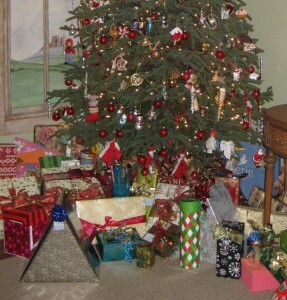 He no longer feels the need to wrap up a pair of socks in a refrigerator box simply to fill out the gift-scape under the tree. His approach emphasizes visual impact and imaginative packaging. In 2011, he enclosed three gifts for our daughter in large cylindrical tubes intended for setting concrete. 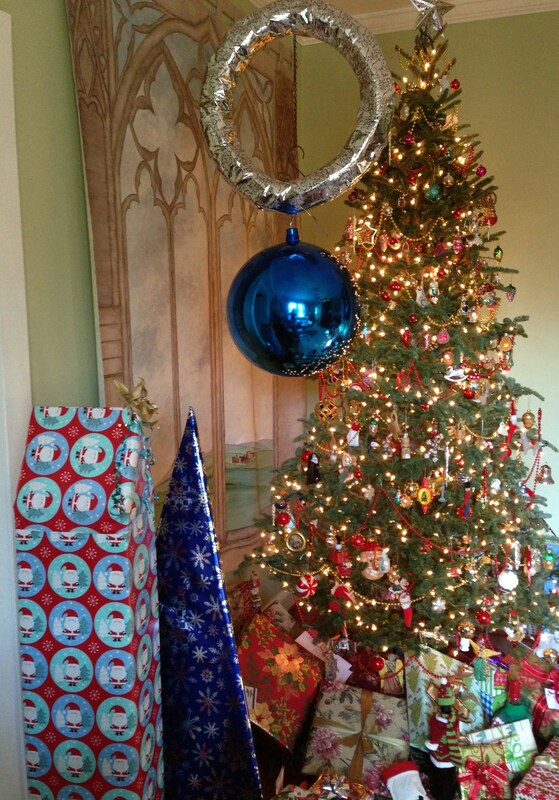 Last Christmas and this year, he followed up with gifts of strikingly unusual shape. 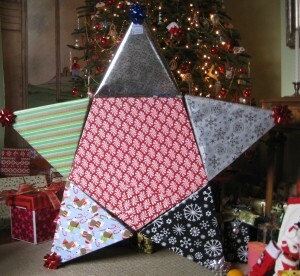 On the morning of Christmas Eve 2012, a modest triangular package appeared under the tree. The tag read, “To D, from Mama and Daddy.” Our daughter was thrilled to see that Daddy had been busy again down in the basement, working on a new packaging scheme. 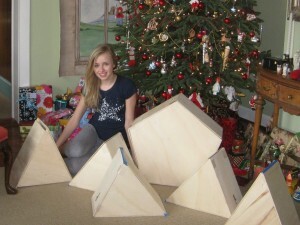 She suspected that the pyramid would be only the first of a series of mysterious packages. She was right, of course. On Christmas morning, the silver pyramid had become one of the arms of a five-pointed star, the center of which was a pentagon-shaped box. Each point contained a small gift, while the pentagon encased a more substantial present. Really, though, the items inside the boxes were almost incidental. The real gifts here were the surprise factor, followed by the intricate process of unwrapping, a sustained big reveal. Above, our daughter sits among the unwrapped elements, the hinged plywood boxes my husband carefully constructed to form the star. His engineering training and math skills equipped him for the endeavor. 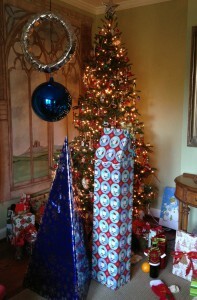 This year, a slender, four-foot tall pyramid turned up by the tree a few days before Christmas. The package prompted my daughter to respond in kind with a last-minute present we had for H. The gift was in a long, narrow box. She disguised the shape by adding a gable-like projection at the top. No doubt about it, she’s her father’s daughter. Although she claims it was unintended, she was nevertheless proud that her creation turned out to be just slightly taller than H’s pyramid. On Christmas Eve, I awakened to the startling sound of drilling coming from under the bed. I assumed H was busy working his holiday magic. Once downstairs, I found an oversized blue Christmas orb suspended from the ceiling. On Christmas morning, the final element of the mobile appeared: a silver-wrapped ring, about the size of a pool life-saver. The uniquely shaped items, as always, were saved for last. The pyramid was another neatly hinged plywood box, large enough for D to sit inside. The silver ring turned out to be a section of pool noodle, taped together, with a tiny gift wedged inside. 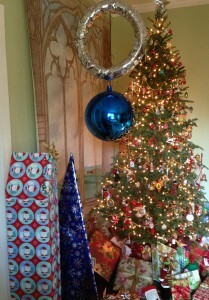 The blue Christmas ball was purely decorative. H was pleased with D’s clever and meticulous wrapping of his gift. 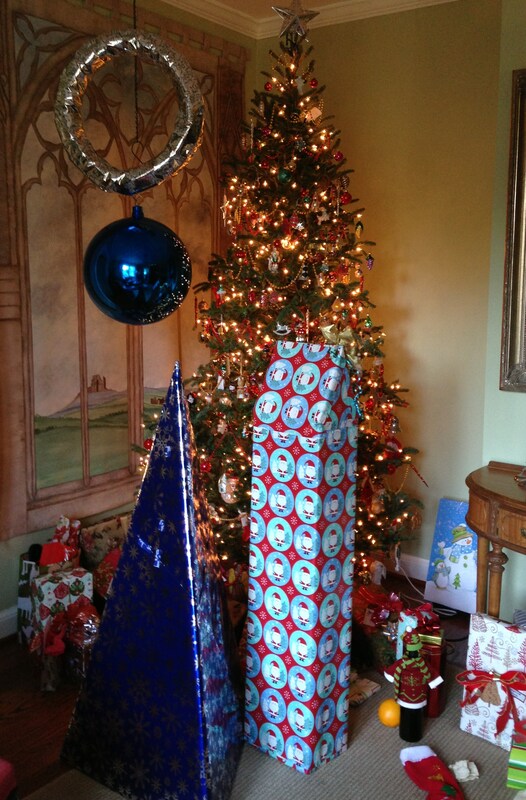 He’s delighted to know that in his daughter’s hands, the family tradition of extreme gift-wrapping has a sure future. Previous PostTime Warp (Another Little Girl in Red)Next PostBaby, It’s Cold Outside!